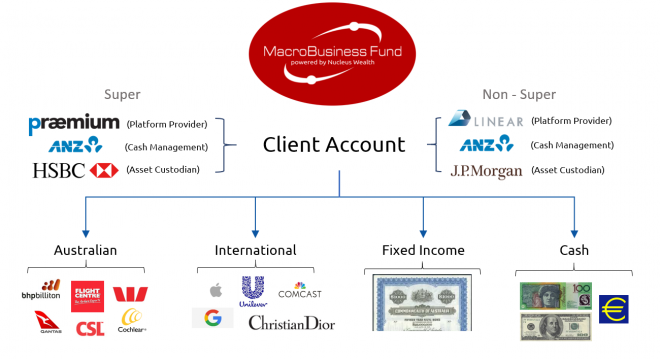 Put the power of MacroBusiness in your portfolio. The chances are that you read Macrobusiness for no-nonsense, unbiased insight into the most pertinent issues in today’s macroeconomic climate. So do over 120,000 other people around the world per month. 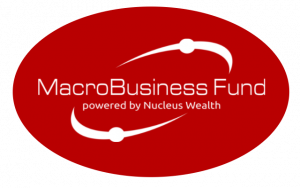 Now can you enjoy the same transparency, clear thinking and market acumen in the MacroBusiness Fund. David, Leith and the team at Macrobusiness have partnered with the like-minded asset manager, Nucleus Wealth, to bring you a new concept in wealth management. the comfort that your investments are secure with a major broking custodian in America’s largest bank, JP Morgan and HSBC for personal super accounts. And all of this is available at fees far below traditional asset management. As an investor in the MB Fund, you can choose whether you would like our experienced financial advice team to ensure appropriate levels of risk for your circumstances, or personally take control of your capital through setting your own risk allocations. You may wish to use the MB Fund to hedge exposures you have elsewhere in your portfolio, or simply choose one of our international portfolios to ensure you have high quality, well-researched investments in ‘the other 98%’ of world markets outside of Australia. The MB Fund is comprised of three different portfolios – each with different risk and asset allocation levels – to ensure that the construction of your portfolio best matches your risk and volatility appetite. David and Leith sit on the investment committee that governs decisions in all portfolios. Please find information relating to these portfolios below. Through the signup up process, you’ll be asked a number of questions that help us determine how your money should be invested, and from there your own, risk-weighted ‘MB Fund’ is put together. We hope you join us in this exciting new adventure for the MB community. To get started, choose from the buttons below.